When you require traffic control in San Gabriel Valley, you have several choices. You either can select one of the stock services and hope for the best. Or you can choose a standout resource and set your mind at ease. If you prefer the latter, the choice undoubtedly will be Roadway Construction Service. 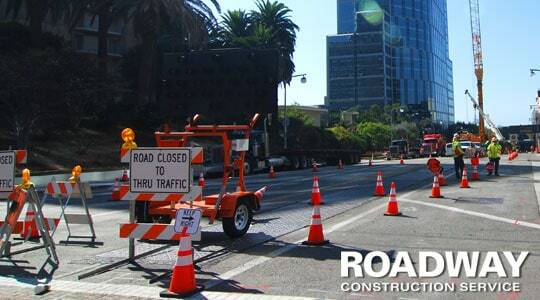 A leader in this very tough field, Roadway Construction Service offers a broad spectrum of road traffic control solutions for San Gabriel Valley. The last thing this region needs is more traffic snarls. Which is why the first thing you should do is reach out to us. Why do we consistently succeed? Well, if there are two things we know it’s — the San Gabriel Valley and how to keep traffic moving safely and efficiently. Combine this knowledge, and you virtually guarantee success. Effective road traffic control for San Gabriel Valley requires the coordination of many elements. So many factors come into play, each with its own requirements. We identify these factors from the get go with very intensive planning. This doesn’t happen overnight. Or even over a few days. Traffic control planning is an exhaustive process that requires careful attention to endless details. What are expected road and whether conditions? How will they impact traffic flow? What is the traffic density? Will there be pedestrians in the vicinity? All this and more must be carefully considered by our planners, or as we sometimes call them, traffic engineers. Part of the traffic control planning stage is the traffic control permitting process. Getting proper work permits is crucial. Without authorization from local decision makers, no traffic control plan could be implemented. Fortunately, Roadway Construction Service has an inside track in this area. Thanks to our experience, we know many of the municipal decision-makers — and their expectations. This familiarity enables us not only to cut through walls of red tape; it also allows us to develop the kind of air-tight plans that consistently meet expectations. An approved plan is our signal to move forward. This action phase consists of two basic components. The human component involves the deployment of onsite personnel such as traffic control flaggers. Qualified by certifications such as OSHA, our flaggers capably maximize the safety of construction zones. When motorists, crews, and pedestrians move through these areas, they can do so with complete confidence. There are true experts on the job. Hardware comprises the other half of the traffic control equation, with traffic control barricades taking center stage. These barriers can take many forms, from the massive and muscular Jersey wall (or K-rail) to the compact but very important, high-visibility cone. When it comes to traffic control in San Gabriel Valley, everyone and everything does an important job. Would you like to learn more about premier traffic control in San Gabriel Valley? Reach out to Roadway Construction Service any time. We’ll be happy to provide additional information and answers to all your questions.